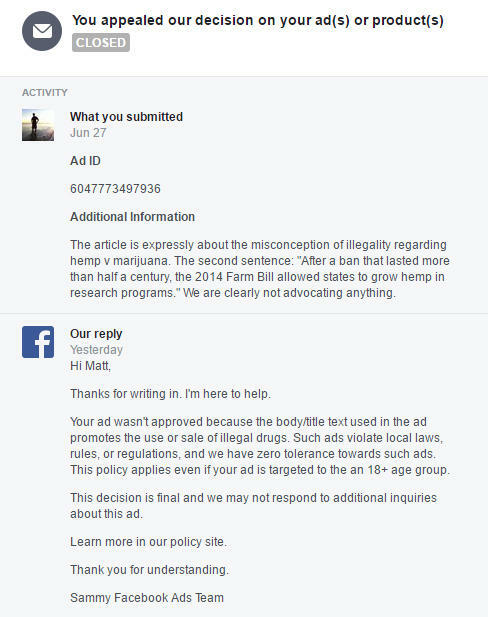 Facebook rejected an appeal to boost the post related to the news story. Half of Tennessee farmers who participated in the state’s return to industrial hemp farming have yet to apply for a permit to grow the highly regulated seed again. In 2015, approximately 50 farmers signed up to grow the crop. With two weeks left to apply, WBIR-TV reports that only 25 farmers have applied. Cocke County farmer Chuck Mason says he thought the crop would be a "gold mine," but when seeds arrived more than a month late due to customs delays, the crop turned into a bust. Mason says he will return to growing hay this year. Kentucky’s new agriculture commissioner says he will pick up where his predecessor left off when it comes to industrial hemp. Ryan Quarles was in Bowling Green Friday for the Kentucky Commodity Conference.